Free crystal structures to go with our software. CrystalMaker X includes an integrated library of approximately 1200 structures: expertly curated, with annotation, metadata and preview - designed for rapid searching and instant display. This library includes over 400 rock-forming minerals, as well as hybrid structures (MOFs, ZIFs, Clathrates), other inorganics and organic structures of technological importance. 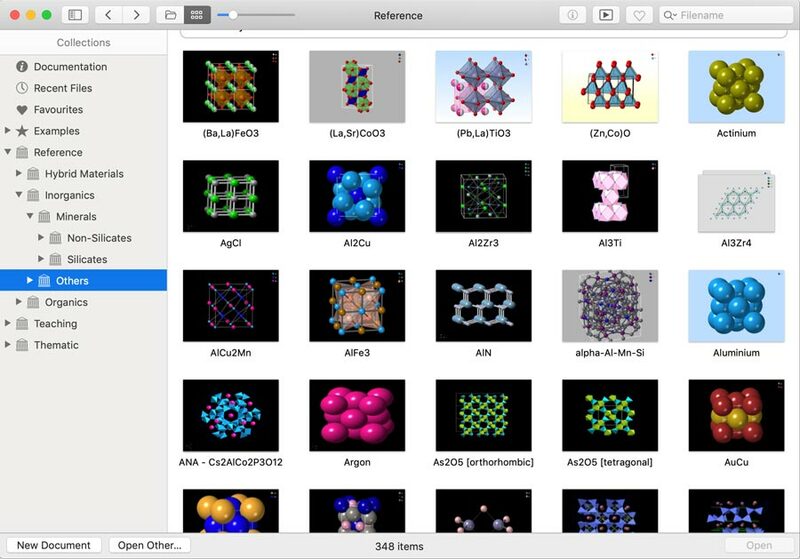 Browsing inorganic (non-mineral) structures in CrystalMaker X's Structures Library. Selecting a thumbnail allows a rotating preview to be displayed, complete with notes. A search field, in the window's top right-hand corner, allows searches by filename, notes or chemical formula. Over 12 000 crystal structures are included here, courtesy of CrystalMaker user Dr Yoshitaka Matsushita (Institute of Solid State Physics, University of Tokyo, Japan). Over 9500 chalcogenides are included here: these are compounds containing one or more elements from group VI(B) of the Periodic Table, i.e., sulphur, selenium or tellurium. Over 1000 pnictides are also included: compounds of the Group V(B) elements P, As, Sb and Bi. The library also includes over 1000 intermetallic structures, plus over 500 appendix structures: miscellaneous oxides, nitrides and halides. Compatibility Note: these files require CrystalMaker 9 or later. If you still cannot find the structure you need, we are very pleased to recommend two open-access databases, which have search facilities and let you download data in (industry-standard) CIF format. If you have a recent version of CrystalMaker, you should then be able to drag-and-drop your file(s) into the program, for instant display. Originally set up by Prof Armel Le Bail, and now with an international board of editors (and significant state subsidies from the government of Lithuania) this database contains many thousands of entries, which can be freely downloaded in the ubiquitous CIF format. Please be aware: The quality is somewhat variable, although the editors have been responsive to the (many) error reports we have submitted. This database is the culmination of a major NSF funding project. It contains a wealth of mineral structures, including every structure published in American Mineralogist, Canadian Mineralogist, European Journal of Mineralogy and Physics and Chemistry of Minerals, plus other sources. Many site labels have been changed from their original, published values. Site occupancies are not correctly reported. Instead, element symbols and (edited) site labels are mashed together, which can result in some uncertainty over exactly which element resides where (e.g., is a site labelled "CA1" bearing a C atom or a Ca atom?!). CrystalMaker does its best to try to deal with this less-and-ideal situation - but we do recommend that you check the resulting structure. Note: you will need to specify the "CIF" format, when downloading data. This is a free - but basic - interface to the quasi-commerical Cambridge Structures Database (CSD - organo-metallic structures) and the Inorganic Crystal Structures Database (ICSD). This interface allows searching by compound name, internal database code (of somewhat dubious value) or publication. We should note that were unable to locate common mineral names such as "quartz", "feldspar", "mica" or "garnet"! More-advanced search functionality (e.g., by chemical composition) requires a paid subscription. Please be aware: In order to download structures as CIF files you will need to provide your name, e-mail address and institution (although, when we tested the interface, it did not appear to be verifying any of the entered details). Please check your data! Whilst all of these databases are reputable, it is not uncommon for files to contain errors. You should always check that your structure appears reasonable before proceeding to take measurements, simulate diffraction patterns, or do other "black-box" operations.